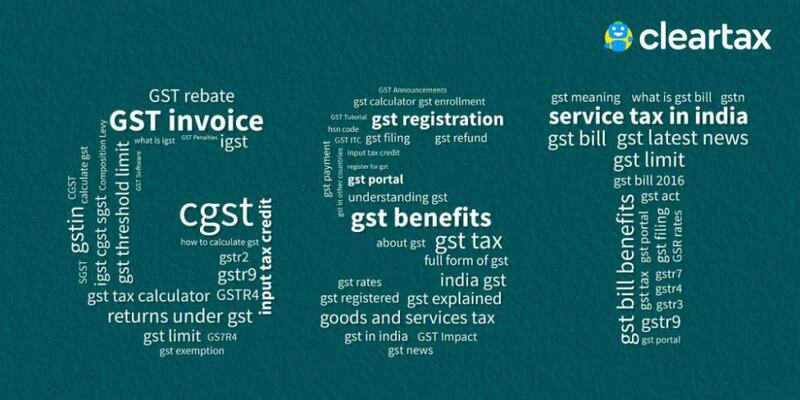 Latest Updates on GST Law! Applicable from 1st Feb 2019, 01/2019 Central tax rate notification & 01/2019 Integrated Tax Rate Notification states that the provision of RCM under Sec 9(4) – purchase of goods from unregistered supplier shall now stand to be applicable blanket all intra-state supplies(irrespective of the daily limit per supplier of Rs 5000 that was earlier notified). Further, the Sec 9(4) has been amended to refer only to specified goods and services as notified by the Government and not all supplies. But the list is yet to be notified, after which this provision Sec 9(4) shall apply to all such supplies notified. This definition has been deleted in its entirety. Earlier Definition: “business vertical” means a distinguishable component of an enterprise that is engaged in the supply of individual goods or services or a group of related goods or services which is subject to risks and returns that are different from those of the other business verticals. New Definition: “cost accountant” means a cost accountant as defined in clause (b) of sub-section (1) of section 2 of the Cost and Works Accountants Act, 1959. Earlier Definition: “cost accountant” means a cost accountant as defined in clause (c) of sub-section (1) of section 2 of the Cost and Works Accountants Act, 1959. This clause has been deleted in its entirety. Earlier clause: the activities to be treated as supply of goods or supply of services as referred to in Schedule II. Amended so as to restrict the levy of tax on reverse charge basis under Section 9(4) on receipt of supplies of certain specified categories of goods or services or both by notified classes of registered persons from unregistered suppliers on the recommendations of the Council. This is against the earlier provision that was applicable for all purchases from the unregistered supplier. Amended so as to raise the statutory threshold of turnover for a taxpayer to be eligible for the composition scheme from Rs 1 crore to Rs 1.5 crores, and to allow the composition taxpayers to supply services (other than restaurant services), for up to a value not exceeding ten per cent. of turnover in the preceding financial year, or five lakh rupees, whichever is higher. Amended and the said amendment is drafting in nature. Amended in order to provide for the input tax credit in cases of “Bill- to-ship-to” model in the case of supply of services. The said Amendment further seeks to include the provisions relating to the new return format as specified in the proposed new section 43A, for availing the input tax credit. Amended in order to further expand the scope of eligibility of input tax credit. Amended in order to exclude the amount of tax levied under Entry 92A of List I of the Seventh Schedule of the Constitution from the value of turnover for the purposes of distribution of credit. Replaced clause (c) of the explanation: the term ‘‘turnover’’, in relation to any registered person engaged in the supply of taxable goods as well as goods not taxable under this Act, means the value of turnover, reduced by the amount of any duty or tax levied under entries 84 and 92A of List I of the Seventh Schedule to the Constitution and entries 51 and 54 of List II of the said Schedule. Earlier clause (c) of the explanation: the term ‘‘turnover’’, in relation to any registered person engaged in the supply of taxable goods as well as goods not taxable under this Act, means the value of turnover, reduced by the amount of any duty or tax levied under entry 84 of List I of the Seventh Schedule to the Constitution and entries 51 and 54 of List II of the said Schedule. Amended so as to increase the threshold turnover for registration in special category States of Arunachal Pradesh, Assam, Himachal Pradesh, Meghalaya, Sikkim and Uttarakhand from ten lakh rupees to twenty lakh rupees. Amended so as to provide for mandatory registration for only those e-commerce operators who are liable to collect tax at source under section 52 of the Act. Amended also as to allow persons having multiple places of business in a State or Union territory to obtain a separate registration for each such place of business, and to insert the provisions for separate registration for a person having a unit(s) in a Special Economic Zone or being a Special Economic Zone developer, distinct from his other units located outside the Special Economic Zone. Replaced proviso: Provided that a person having multiple places of business in a State or Union territory may be granted a separate registration for each such place of business, subject to such conditions as may be prescribed. Earlier Proviso: Provided that a person having multiple business verticals in a State or Union territory may be granted a separate registration for each business vertical, subject to such conditions as may be prescribed. Amended so as to provide for temporary suspension of registration while the cancellation of registration is under process. “Provided further that during the pendency of the proceedings relating to cancellation of registration, the proper officer may suspend the registration for such period and in such manner as may be prescribed.”. Amended so as to allow registered persons to issue consolidated credit or debit notes in respect of multiple invoices issued in a Financial Year, by replacing sub-section (1) and (3), at words: “Where a tax invoice has” or “a credit note” or “a debit note” with “Where one or more tax invoices have” or “one or more credit notes for supplies made in a financial year” or “one or more debit notes for supplies made in a financial year” respectively. Amended so as to provide that any Department of the Central or State Government or local authority which is subject to audit by the Comptroller and Auditor-General of India need not get their books of account audited by any Chartered Accountant or Cost Accountant. Section 39. Furnishing of returns: Amended so as to provide for prescribing the procedure for quarterly filing of returns with monthly payment of taxes. goods or services or both, input tax credit availed, tax payable, tax paid and such other particulars as may be prescribed. on or before the twentieth day of the month succeeding such calendar month or part thereof. Section 43A: Procedure for furnishing return and availing input tax credit. (ii) who has defaulted in payment of tax and where such default has continued for more than two months from the due date of payment of such defaulted amount, shall be such as may be prescribed.”. Section 48. Goods and services tax practitioners: Amended so as to allow Goods and Services Tax Practitioners to perform other functions such as filing the refund claim, filing the application for cancellation of registration, etc. A registered person may authorise an approved goods and services tax practitioner to furnish the details of outward supplies under section 37, the details of inward supplies under section 38 and the return under section 39 or section 44 or section 45 and to perform such other functions in such manner as may be prescribed. Amended in order to provide that the credit of State tax or Union territory tax can be utilised for payment of integrated tax only when the balance of the input tax credit on account of central tax is not available for payment of integrated tax. The input tax credit as self-assessed in the return of a registered person shall be credited to his electronic credit ledger, in accordance with section 41 or section 43A, to be maintained in such manner as may be prescribed. Newly inserted: This Section seeks to specify that a taxpayer would be able to utilise the input tax credit on account of central tax, State tax or Union territory tax only after exhausting all the credit on account of integrated tax available to him towards payment or integrated tax, Central tax, State tax or Union territory tax. Newly inserted: This Section seeks to empower the Government to prescribe any specific order of utilisation of input tax credit of any of the taxes for the payment of any tax. Where the details of outward supplies furnished by the operator under sub-section (4) do not match with the corresponding details furnished by the supplier under section 37 or section 39, the discrepancy shall be communicated to both persons in such manner and within such time as may be prescribed. Amended in order to provide that the principle of unjust enrichment will apply in case of a refund claim arising out of supplies of goods or services or both made to a Special Economic Zone developer or unit, and to allow receipt of payment in Indian rupees, where permitted, by the Reserve Bank of India in case of export of services. ‘Explanation.––For the purposes of this section, the word person shall include “distinct persons” as referred to in sub-section (4) or, as the case may be, sub-section (5) of section 25.’. Amended Authority”, in order to specify twenty-five crore rupees as the upper limit of the amount of pre-deposit payable for the filing of appeal before the Appellate Authority. Amended in order to specify fifty crore rupees as the upper limit of the amount of pre-deposit payable for the filing of appeal before the Appellate Tribunal. Amended in order to increase the time limit before which proceedings shall be initiated. Where the person transporting any goods or the owner of the goods fails to pay the amount of tax and penalty as provided in sub-section (1) within fourteen days of such detention or seizure, further proceedings shall be initiated in accordance with the provisions of section 130. Amended in order to clarify with retrospective effect from 1st July 2017 that the cesses and additional duty of excise (on textile and textile articles) levied under the pre-Goods and Services Tax laws shall not be a part of the transitional input tax credit under the goods and services tax. Amended in order to empower the Commissioner to extend the time limit for return of inputs and capital goods sent on job work, up to a period of one year and two years, respectively. Amended the title of Schedule II of the principal Act from “Activities to be treated as a supply of goods or supply of services” to “Activities or transactions to be treated as a supply of goods or supply of services”. “Activities or transactions which shall be treated neither as a supply of goods nor a supply of services”. ‘Explanation 2.––For the purposes of paragraph 8, the expression “warehoused goods” shall have the same meaning as assigned to it in the Customs Act, 1962.’. Words ‘‘being a business vertical’’ shall be omitted. Amended to make a provision for settlement of balance in the integrated tax account equally between the Central Government and the State Governments or the Union territories, as the case may be, on ad hoc basis and shall be adjusted against the amount apportioned under the said sub-sections.